Even today with quality improvement the battle cry of American industry, the quality programs in most companies are limited to "conformance to technical standards," according to quality expert Bradley Gale. While some have ventured a step farther to measure customer satisfaction, few of them, Gale demonstrates, have attempted to track market-perceived "quality" -- how buyers select among competing suppliers, why orders are won or lost, and which competitors are succeeding in which market segments. Using cases including Milliken &amp; Company; AT&amp;T, United Van Lines, and Gillette, Gale shows how leading-edge companies have gone beyond the minimal achievements of conformance quality and customer satisfaction to focus on the third, higher stage, "market-perceived quality versus competitors" and aspire to an emerging fourth stage, "true strategic management." Drawing on his extensive research at AT&amp;T, Johnson &amp; Johnson, Parke-Davis, and other world-class companies, Gale provides new metrics for market-perceived quality that are straightforward and easy to interpret. His set of seven integrative tools for customer value analysis makes up the heart of the "war room wall" to help guide business-unit teams in their effort to outperform competitors in satisfying customers. The great value of these tools is that they are derived from a future-oriented strategic navigation system that tracks competitive information and market-perceived quality. Learning to master this system accelerates customer satisfaction from a slogan to a science and leads ultimately to true strategic management -- the fourth stage of Total Quality Management. The processes described in this book provide an insider's perspective on the criteria of the Baldrige Award. Bradley Gale's insights and innovative methods for defining, measuring, and improving market-perceived quality will create an entirely new thrust for the worldwide quality movement. Curt Reimann is the most unlikely national leader imaginable -- a mild-mannered chemist who has spent virtually his entire career in Gaithersburg, Maryland, at the National Bureau of Standards and its successor, the National Institute of Standards and Technology. He hasn't had much business experience. But he clearly has not lacked vision. No one in the decades since World War II has done more to advance U.S. management thinking. Reimann deserves primary credit for the success of the Malcolm Baldrige National Quality Award. In the mid-1980s, when Reimann was the unknown deputy director of the Bureau of Standards' National Measurement Laboratory, he was chosen to head the bureau's Quality Council. Then things began to happen fast. Malcolm Baldrige, Ronald Reagan' s secretary of commerce and an advocate of a national quality award, died suddenly in a fall from a horse. Backers of the award suggested it be named after Baldrige. The Bureau of Standards promised to give the first award in Baldrige's memory before the Reagan administration left office. As a result, the administration threw its whole support behind the idea, and Congress approved it in the summer of 1987. Thus, Reimann had to develop ways to define quality, to select companies that really achieved it, and to present the first awards, all within seventeen months. It was an almost unimaginably difficult task. Most difficult of all, he had to do everything without alienating the thousands of advocates of "quality" -- who defined that term in hundreds of different, often contradictory ways. In 1987, quality advocates were divided into factions supporting competing gurus -- W. Edwards Deming, J. M. Juran, Philip Crosby, and others. And unfortunately, companies could achieve quality as any of the gurus defined it, yet still fail to produce a product that would win and keep customers. So Reimann' s job was hard. "Trying to create a state religion might have been easier," Reimann says. Yet Reimann succeeded to a far greater extent than anyone had a right to expect. From the time President Reagan gave out the first award in December 1988, the Malcolm Baldrige National Quality Award has been a key standard of excellence throughout the United States and, indeed, much of the world. Thousands of executives testify that studying the Baldrige award criteria has helped them make dramatic improvements in their organizations. How did Reimann do it? The most important fact was that he thought carefully about the basic question: "What is quality?" As a result, he and his committee defined quality in a more complete way than anyone had up to that time. And in doing so, Reimann not only made his award highly sought-after; he also made it easier for U.S. companies to deliver quality and value their customers would recognize and delight in. The quality movement in the United States has developed in four stages, driven largely by the learning that Reimann set in motion. Many organizations today are just entering the third stage; only a handful are ready to enter the fourth. The entire period prior to the introduction of the Baldrige award can be called the conformance quality stage. The introduction of the award, with its customer-oriented judging criteria, quickly moved the movement to a second stage focused on customer satisfaction. The Baldrige award criteria laid the groundwork for a third, more sophisticated stage, focusing on the achievement of superior market-perceived quality and value versus competitors. Finally, the Baldrige award and its judging criteria pointed toward a fourth stage, customer value management, that will build on the learning of the first three and enable organizations to understand and think about their strategies and their roles in society better than they ever have in the past. That stage is just now on the horizon. The purpose of this book is to help you and your organization achieve the full benefits of the third and fourth stages of the quality movement by learning to use a set of tools called customer value analysis. The development of these tools began before the Baldrige award was even conceived of. The experience that went into them helped Reimann and his staff develop the original Baldrige criteria. Today, these tools have been greatly refined. With them, you can now reliably track how customers in your marketplace judge your product or service in comparison to the competition' s. Then you can use that knowledge to delight customers and to choose profitable markets and technologies, thus creating a truly prosperous organization. This book will offer a tested set of metrics that will tell you how well you're doing and where to focus your efforts so you'll satisfy more customers more profitably. It will present a clearly defined set of methods that will help you learn from those metrics and communicate the learning to the key people who must understand it. It will tell detailed stories of numerous companies that have used these tools successfully. And finally, it will provide clear evidence, from new studies using the world's only complete database of corporate competitive information, that achieving superior quality and customer value as we are defining those terms in this book really leads to superior profits. 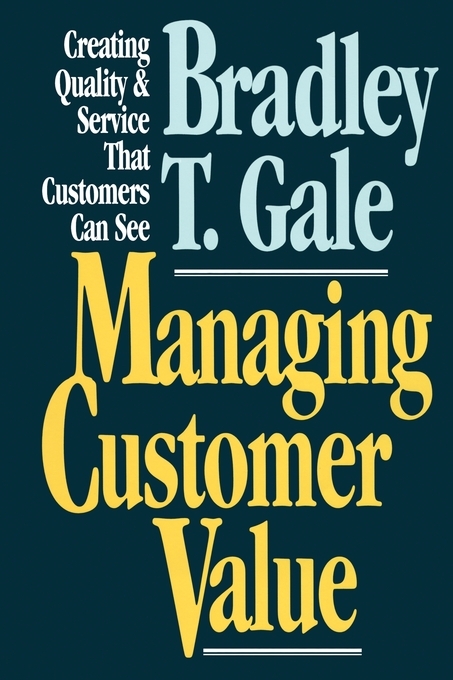 In other words, this book will introduce a complete customer value management methodology, based on ideas that helped Reimann and his associates create the Baldrige Award. It will provide clear evidence that the methodology works. And it will demonstrate that this is an approach to strategic management that will dependably produce superior profits through happy customers. American Telephone &amp; Telegraph is one company that has learned to track and provide customer value well. Over the past six years it has developed some of the methods of customer value analysis we will discuss in this book, and its commitment to customer value management makes it one of the leaders in moving into Stage Four of the quality movement. Consider how customer value analysis methods have benefited AT&T in just one business, long-distance network services. They showed the company how to turn around a potential disaster. AT&T spent the years after its breakup in 1983 losing market share. As we'll describe in Chapter 4, the losses were particularly painful to quality advocates, because AT&T's old-fashioned "customer satisfaction" surveys showed the company was scoring well even in the businesses that were losing share most dramatically. In long-distance, the company's core business, the share losses were running at six points a year -- equivalent to more than a billion dollars a year in sales. Many executives despaired of maintaining AT&T's premium-priced position. They advocated wholesale cost-cutting and a price war with MCI and Sprint. But two AT&T associates, Ray Kordupleski and Paul Dernier, began to use customer value analysis techniques to analyze the problem. We'll discuss the techniques in detail in later chapters, but here it's enough to say that Kordupleski and Dernier showed that customers were willing to pay for quality in long-distance and that customers could recognize superior quality. Moreover, even as AT&T lost market share, customers still perceived AT&T's technical quality to be better than that of competitors. Kordupleski and Dernier showed the key problem was that AT&T's overall lead in perceived quality just wasn't enough to justify its perceived higher price: First, customers perceived AT&T's price premium to be higher than it really was. And second, AT&T's lead in perceived quality was narrowing. MCI and Sprint had newer networks, with more modern fiber optic cable and thus less noise. The competitors were also challenging AT&T in billing and installation quality. If AT&T continued with its existing programs, it would continue to provide excellent technical quality -- but it wouldn't be the best relative quality any more. And Kordupleski and Dernier's analysis showed that AT&T needed superior relative quality to justify its market leadership. What happened? Influential young executives convinced AT&T's top leadership to make changes. One decision: AT&T would write off fully $6 billion of obsolete plant and equipment years ahead of schedule and add $2 billion a year to capital spending. As a result, in 1988 AT&T reported the first loss in its one-hundred-year history. But spending began to boost AT&T's technical quality. And not a moment too soon. Surveys showed that AT&T's perceived technical quality continued to decline during 1988. It hit a low in October 1988 -- when customers found AT&T's performance was just at parity with competitors'. But then it bounced back. Meanwhile, AT&T set up teams to improve the billing and installation processes. And the company used its new understanding of perceived prices to design a series of "I came back" ads, in which customers declared that the savings they expected in switching from AT&T proved illusory. Surveys showed the company's perceived price disadvantage reached its maximum in May 1988, and then declined through August 1989 -- though actual relative prices were stable. Follow-up research showed AT&T had nearly lost its leadership in long-distance. Its overall worth-what-paid-for score actually fell behind competitors in May 1988, and the company didn't return to parity until March 1989. But then after remaining even with MCI for two months, it began to pull ahead in mid-1989. The ultimate result: AT&T's market share losses were virtually halted and its dominant position in the marketplace maintained. The company, which as we'll show in Chapter 4 has begun to use customer value techniques throughout its operations, has become a model of excellent American management as well as a paradigm of profitable growth. According to AT&T's 1992 Annual Report, it earned $6.27 billion of operating income in 1992. In this chapter, we'll look at the evolution of the "quality movement" and show why it must move toward "customer value management." To understand what needs to be changed in your own organization, it's vital to comprehend what America has already accomplished. Today, the performance of a handful of companies like AT&T, who understand market-perceived quality versus competitors and customer value management, differs vastly from the business world of 1987, when the Baldrige award was introduced. At that time, most managers and consultants were still at Stage One in the management of quality: they focused on quality as conformance. They'd been inspired by the NBC "White Paper" television documentary "If Japan Can -- Why Can't We?" which introduced W. Edwards Deming in 1980. Or they had read Philip Crosby's 1980 book Quality Is Free. Deming and Crosby both emphasized getting control of processes so that production would conform to specifications. They helped companies realize that "doing things fight the first time" would lead to better products at lower costs. As a result, companies introduced statistical quality control and sought every opportunity to reduce errors, scrap, and rework. By 1987, American products had begun to improve because of these efforts. This work was vitally important. It had been neglected for decades. Disputes among the gurus dealt with important matters of both style and substance. Unfortunately, however, the conformance quality that companies were seeking in Stage One wouldn't, by itself, lead to business success. A product with "zero defects" won't necessarily make customers happy. What if the specifications that a company is trying to conform to are wrong -- that is, what if they don't represent what the customer actually wants to buy? Inevitably, companies had to move beyond Stage One. Exhibit 1-1 shows the path that companies have typically taken. By 1987 a few, led by Xerox and its president David Kearns, had moved into Stage Two, customer satisfaction. They realized that the purpose of quality programs was to create happy customers. So they began talking to customers more and asking them if they were satisfied on a range of issues. When Reimann started work on the Baldrige award, not many companies focused on customer satisfaction. But Reimann decided from the beginning that the Baldrige would view quality from the customer's point of view. That's why he invited not just traditional quality specialists to review the Baldrige award criteria, but also people like me who studied how customers' desires could be understood and fulfilled. Against a tight deadline, Reimann managed to persuade the overwhelming majority of quality specialists that the customer's perspective was the right way to measure quality. Improving conformance to technical standards was essential, but only as part of the larger process of making customers happy. 1. Leadership (95 points). Senior executives' personal leadership and involvement in creating and sustaining a customer focus and clear and visible quality values. 2. Information and Analysis (75 points). The scope, validity, analysis, management, and use of data to drive quality excellence and improve competitive performance. 3. Strategic Quality Planning (60 points). The company's planning process and how the company integrates all key quality requirements into overall business planning. 4. Human Resource Development and Management (150 points). How the company develops its workforce and realizes the workforce's full potential so it can pursue the company's quality and performance objectives. 5. Management of Process Quality (140 points). The systematic processes the company uses to pursue ever-higher quality, including design, quality assessment, systematic quality improvement, and the management of process quality in all work units and suppliers. 6. Quality and Operational Results (180 points). The company's actual measured quality levels and improvement trends, company operational performance, and supplier quality. Also, current quality and performance levels relative to competition. 7. Customer Focus and Satisfaction (300 points). The company's relationship with customers and its knowledge of customer requirements and of the key quality factors that determine marketplace competitiveness. Also, the company's methods of determining customer satisfaction, current trends and levels of satisfaction, and these results relative to competitors. The complete Baldrige award criteria appear in Appendix A. By causing companies to focus on customer satisfaction, the Baldrige criteria put American business firmly into Stage Two of the quality movement. Soon hardly anyone would launch a "quality program" without claiming that customer satisfaction was its central goal. The categories relate closely to each other, and can be thought of as a customer satisfaction system. At the first meeting of quality "experts" called to discuss a draft of the criteria, I sketched out a flowchart linking the categories. It's been revised several times since 1987, and in its present form it appears in Exhibit 1-2a. Thanks to Reimann's leadership, the criteria made clear that quality was more than a technical specialty -- that pursuit of quality should drive an entire business. As a result, companies throughout the United States, and indeed all over the world, found the Baldrige criteria formed a definition of quality superior to those used in the past -- more complete, easier to act on, and more closely linked to business results. The criteria were not without faults, but a company that achieved excellence on these dimensions would indeed have delivered quality that the customer could see, and unless it faced unusually brilliant competitors it would reap the fruits of that excellence on the bottom line. That's why the Baldrige criteria became the consensus definition of total quality management throughout the United States. But "customer satisfaction" -- at least as it was traditionally measured by research firms -- didn't fully summarize what the Baldrige criteria sought to promote. The Baldrige award criteria asked about customer satisfaction differently from traditional survey approaches. And so they did a good deal to push companies toward Stage Three, the focus on market-perceived quality and value versus competitors. Most companies today spend a good deal of money on research about their customers and their markets. But mostly this research still fails to tell them why they win or lose customers. * What are the attributes that count in your purchase decision? * What is the relative importance of each attribute? * How would you rank our performance score on each attribute -- poor, fair, good, or excellent? Unfortunately, it isn't unusual for customers to say performance is "good" -- occasionally even "excellent" -- and nonetheless stop buying a product. Two key issues are missing from these surveys. First, they fail to obtain data from noncustomers who are buying the competition's product. Thus, they don't track the opinions of the market as a whole. Second, customer satisfaction surveys usually don't measure the product's performance relative to competitors' products. If your performance is improving, your customers will probably say they are satisfied. But if your competitors are improving faster, customers will soon realize they could be even more satisfied if they bought from your rival. The Baldrige criteria asked companies to provide data on customer satisfaction as it was traditionally measured. But they also asked companies to provide data on their quality performance relative to competitors. For hundreds of companies, reading the Baldrige criteria provided the first impetus to develop rigorous ways of comparing their own performance to their competitors'. * Second, companies ask not just what people think of their products, but how their products compare with the competition on each of the quality attributes. Then, with this data, they construct a clear, reliable picture of just what causes customers to make their decisions. In this book, we'll show that the few companies who do this well obtain a clear picture of what they must change to induce more customers to buy from them. A few companies, mainly members of the Profit Impact of Market Strategy (PIMS) program of the Strategic Planning Institute, had entered Stage Three long before the Baldrige award was born (see box). Milliken &amp; Co., for instance, whose story we will tell in Chapter 3, was a pioneer in entering the "customer satisfaction" stage in the early 1980s and had achieved a fully developed understanding of market-perceived quality versus competitors by 1985. But most are just beginning to understand market-perceived quality versus competitors today. Focusing on market-perceived quality versus competitors is essential to make true strategic thinking possible. The advance from Stage Two to Stage Three, when companies have managed to achieve it, has involved a dramatic shift in focus -- from satisfying current customers to beating competitors by attracting both customers and noncustomers in the targeted market. And providing superior quality pays off on the bottom line. Using the market-perceived quality metric that we will describe in Chapter 2 and the Profit Impact of Market Strategy (PIMS) database, we can demonstrate that companies who move into a superior quality position with a market-perceived quality ratio that is at least 24 percent better than their competitors earn a return-on-sales of more than 12 percent (Exhibit 1-3). (See the Preface and the description of the PIMS database in Chapter 3 for details.) Businesses that get pushed into an inferior quality position with a market-perceived quality ratio that is 24 percent or more worse than the competition earn a profit that is less than 4 percent of sales. The Strategic Planning Institute (SPI®) is a not-for-profit research and service organization dedicated to helping its members develop and implement successful market strategies. The focus is on helping strategists learn from the experience of others. SPI manages the PIMS® (Profit Impact of Market Strategy) program, maintaining a database of the detailed market-strategy experiences of 3,000 businesses. SPI, member company, and university researchers use these data to identify and quantify relationships between market strategies and business results. SPI sponsors councils that are working groups of managers responsible for a particular area of business practice. In regular meetings, council members seek to understand and advance the state of the art in their area of interest. In other words, businesses that deliver superior quality are three times more profitable than businesses that find themselves offering quality that customers consider inferior. "Quality" means little in business unless customers perceive your quality as superior to your competitor' s. Knowing how to achieve this kind of quality is all that matters. So true total quality management, as articulated in the Baldrige award criteria and also in some approaches that attempt to go beyond those criteria, must combine the insights companies have achieved in Stages One, Two, and Three. Today the Baldrige criteria, administered by the National Institute of Standards and Technology, influence how most large businesses are managed. The goal of a business, however, should not be to win awards but to serve customers and, by doing so, earn superior profits and make a contribution to society. Businesses reach Stage Four, tree customer value management, when they integrate total quality management developed in the first three stages with the company's classic management systems (strategic planning, budgeting and control, capital investment, competitive analysis, performance measurement and reward). * What business should we be in? * How should we measure financial results (accounting versus cash flow measures)? * How should we allocate capital across businesses? * Are there good linkages among our company's budgeting, strategic planning, capital investment, and performance and reward systems? * Is there a good linkage between our incentive compensation system and our measures of business results? * Should we be a one-nation or a global business? In addition, the Baldrige criteria don't cover all aspects of the innovation process. A company that achieves excellence on the Baldrige criteria will be in a good position to manage its innovation processes well. The whole organization will be attuned to customers and committed to continuous, rapid improvement. But the Baldrige criteria by themselves don't guarantee a complete innovation process appropriate to businesses in fast-moving fields such as computer software or pharmaceuticals. And they won't prevent companies from failing because they neglect or mismanage big strategic decisions. Several excellent organizations have pursued total quality in their core businesses but also made strategic decisions to expand into other fields where they did not know how to become market-perceived quality leaders. Xerox created a Baldrige award-winning total quality process that converted its copier business from a dying old manufacturer to a profitable world leader. But its expansion into financial services led to disaster. Westinghouse Electric made many of the same mistakes. A complete customer value management system must build on total quality management as described in the Baldrige criteria. But true customer value management adds a sophisticated understanding of these other issues. It uses the knowledge developed in the first three stages to understand whole businesses better. Then it applies management discipline to ensure that this knowledge is used, so companies enter and invest only in businesses where they can be quality and value leaders. Customer value management is what discussions of "strategic management" should have sought from the beginning. In the 1970s and '80s, "strategists" often failed to consider the management of processes within the organization or the processes by which customers made their decisions to buy. Without analyzing these important issues, strategic discussions often produced "plans" without any clear explanation of how the plans should be executed. Such attempts at strategic management were wasted -- and indeed often led to multibillion-dollar fiascoes. Today, companies that have learned the lessons of the three stages of total quality management have their processes under control and understand how to analyze customer decisions. Thus, they can really manage strategically in ways that companies of the 1970s and '80s could not. In Stage Four, corporate strategists fully understand quality efforts, and they know how changes in market-perceived quality drive other aspects of competitive position. They use this information to make decisions that will enable the company to produce the most value and will thus have maximum benefit in the long run for shareholders, customers, and society (Exhibit 1-4). In the language of the Baldrige criteria, this book is about "customer focus and satisfaction" -- the central element of "quality" for which the Baldrige criteria wisely give 300 of the 1,000 total points. This book will show how companies have identified the attributes that are important to customers, how to understand the importance customers give those attributes, and how to analyze performance relative to competitors on each attribute. Then, it will show how to drive your business from this understanding of what quality means to your customers. The measurement systems discussed here complement traditional quality-control technology, but are ultimately of more fundamental strategic importance. If you are starting a quality program for scratch today, you should begin with what has been Stage Three for most companies -- aiming to create better market-perceived quality than your competitors, using the tools in this book to do so. Although total quality management as outlined in the Baldrige criteria isn't the whole of business excellence, and in this book we are pointing out the need for a stage that goes beyond what the Baldrige criteria describe, this book will emphasize that total quality should still be the central focus of management. When today's successful managers discuss business with their employees, they talk unceasingly about total quality and about creating better market-perceived value than their competitors. Top managers by themselves can handle the strategic questions outside the realms of total quality and innovation. But wise managers know they can only achieve excellent quality and value with constant support from everyone in the organization. The wrong way is to talk to employees about total quality and also about "cost reduction," "productivity improvement," and "enhancing shareholder value," as though those are additional, separate goals. This usually produces confusion, alienation, and minimal progress toward any goals. Most employees equate "cost reduction" and "productivity improvement" with layoffs. How can they develop deep commitment to such goals? "Enhancing shareholder value" certainly excites people who have large stock-option packages. But what about the rest of the organization? Top management's favorite programs are "turnoffs" to the majority! Moreover, once your employees have developed commitment to providing the highest market-perceived quality and customer value, it's relatively easy to show that achieving those goals demands that the company cut costs, increase productivity, and increase shareholder value better than anyone else in your industry. Thus, the executive whose company will achieve true customer value management and truly maximize shareholder value is the executive who focuses on total quality without neglecting other strategic variables. This book is designed to show in detail how to achieve success. We'll describe how to create market-perceived quality and value superior to your competitors'. And we'll tell how to integrate the building blocks of a total quality management system (conformance quality, customer satisfaction, and market-perceived quality) with the other strategic management systems of your company (including financial budgeting and control, strategic thinking and planning, and capital investment systems). In the chapter that follows this one, Chapter 2, we'll present a basic model of how the customer makes the purchase decision and we'll summarize the tools of customer value analysis ensuring that the customer has good reason to choose your product or service. We use the classic Perdue chicken story to illustrate the customer's supplier-selection process and to show how to calculate and improve your business's market-perceived quality. Frank Perdue converted an ordinary farm, producing a quintessential commodity product (chickens), into a large business with a dominant power brand in his targeted market (the eastern United States). He did it by decoding the signals that the market was willing to give to any chicken producer who would listen, and subsequently achieving superior market-perceived quality. Then in Part Two (Chapters 3 through 6), we'll look at companies that are truly achieving total quality management and leadership in market-perceived quality through the use of the techniques we're describing. Chapter 3 describes how Milliken used these tools to transform its business. Chapter 4 shows how AT&T is achieving unprecedented success by using these tools to ensure that the company is the customer value leader in all its markets. Chapter 5 examines Warner-Lambert's Parke-Davis unit and tells how it repositioned itself in the enormous market for cholesterol-regulating drugs by using the tools of customer value analysis. Parke-Davis used a customer value profile to understand what the customer was failing to comprehend about its drug Lopid. Then it developed education programs to ensure that customer understanding improved in the areas where the profile showed it was weak. In Chapter 6 we focus on service businesses, using AT&T's Universal Card and United Van Lines' moving business as examples. And we look at the role of customer-service quality in all kinds of businesses. The market-perceived quality approach helps United Van Lines serve customers in both the moving of goods (the "core service" of the company) and in providing "customer service" attributes such as friendly, knowledgeable people answering the phone both in the city where the move begins and in the city where it ends. These chapters are focused on the basics: providing superior customer value in your existing businesses. But there's more to customer value management than that. Part Three (Chapters 7 and 8) looks at some issues that involve more comprehensive customer value management: the creating and maintaining of "power brands," and the achievement of excellence in technology management. Chapter 7 asks the question, "What is a power brand?" It provides a balanced understanding of branded products, using the tools of customer value analysis and data from the PIMS database. We seek to replace the hype that has surrounded brand issues with a reasoned approach based on the principles of customer value management. Chapter 8 then tells the stories of several companies that have used customer value analysis and similar approaches to understand technological opportunities and transitions -- and to profit thereby. By the end of Part Three we will have demonstrated conclusively that real companies are using customer value analysis and are profiting. In Part Four (Chapters 9 through 11), we describe the specific techniques in more detail and show how to integrate them with other management systems to achieve true strategic management. Chapter 9 describes each of the seven tools of customer value analysis comprehensively. Chapter 10 tells how to bring all the knowledge of your organization to bear on your problems through the "war-room" method of conducting meetings and through the development of a powerful strategic navigation system to guide your business. Chapter 11 then tells how to integrate your existing management tools with the market-driven quality philosophy. Finally, in Part Five (Chapters 12 through 14), we go beyond what scholars sometimes dismiss as "anecdotal evidence" to look at evidence from the "big picture" and show how to avoid problems that have caused potentially successful total quality management efforts to fail. In Chapter 12 we provide hard, statistical evidence, based on the PIMS database, of just how quality drives business results. The strategic management of market-perceived quality pays off, as Exhibit 1-3 showed. The experience of three thousand businesses in the PIMS competitive strategy database overwhelmingly indicates that businesses with superior quality create shareholder value by earning larger market shares and premium prices. In Chapter 13 we look closely at the Baldrige award and alternative schemes for judging "total quality." We show why, despite the flaws of some Baldrige winners, the Baldrige criteria and the lessons companies have learned in trying to meet those criteria deserve to be seen as the central guiding force in the renovation of management today. Last, Chapter 14 focuses on making comprehensive alignment of a business actually occur -- starting with the business unit general manager and his or her cross-functional team. An excellent methodology doesn't guarantee success, and even when you know the power of customer value analysis, you can still fail. Chapter 14 shows how to avoid the traps, and win. Customer value is the most important concept and the most important target in business management. I think this book provides a reliable way to achieve it. Bradley T. Gale is president of Market Driven Quality Inc. He served as Overseer for the Malcolm Baldrige National Quality Award during its first three years of existence, and currently is on the Steering Committee for the Conference Board's Total Quality Management Center. Gale is coauthor with Robert D. Buzzell of The PIMS Principles (Free Press, 1987), which has been translated into four languages.